Having the proper attire at our tea party not only set the perfect mood, but also provided a great activity to keep the girls busy. Here is some more info for the fascinators that were such a hit at the party. 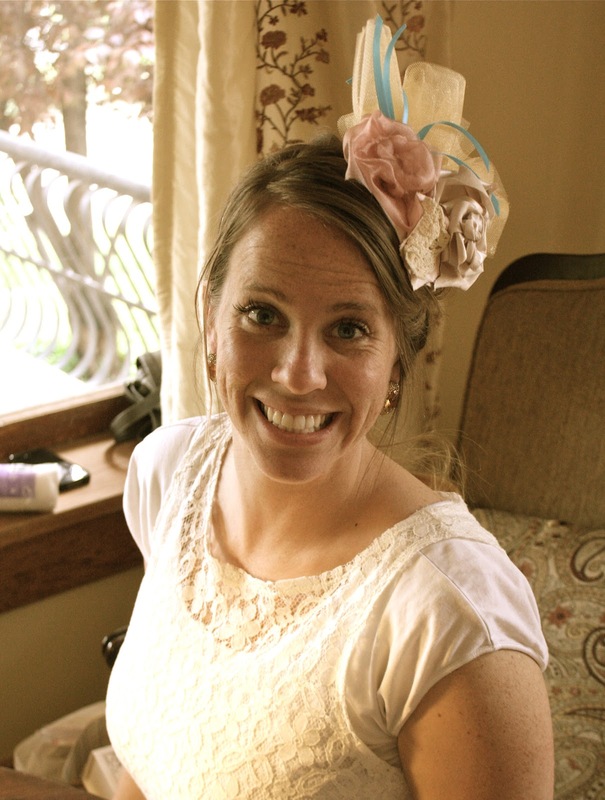 I made the base of the fascinator before the party so they could quickly be assembled. 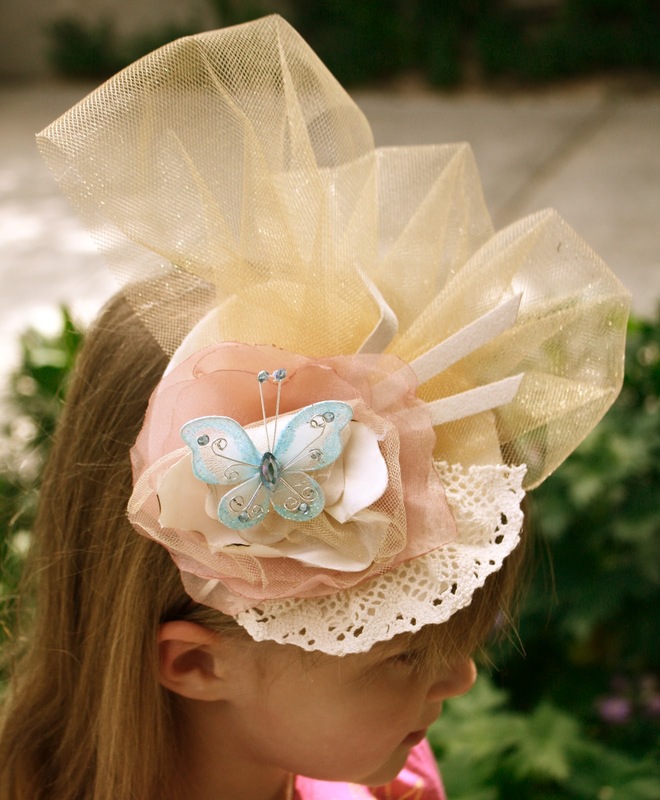 The base of the fascinator is made by sandwiching a headband in-between two felt circles. It's held together with hot glue. The top circle is 5" and the bottom circle is 3". I used my Go! Baby fabric cutter to cut the circles, but you could easily trace a bowls or cups about those sizes. I purchase the silver headbands from Ribbon Retreat, for 40¢ a piece. 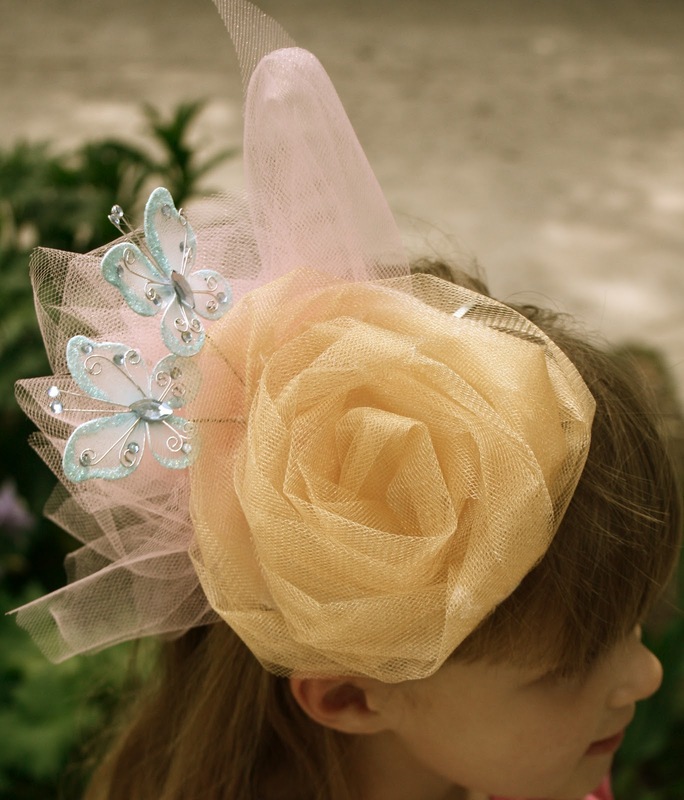 The first step was letting each girl chose a gold or pink tule for the flare at the top of the fascinator. I attached the tule myself so that no one would get burned. 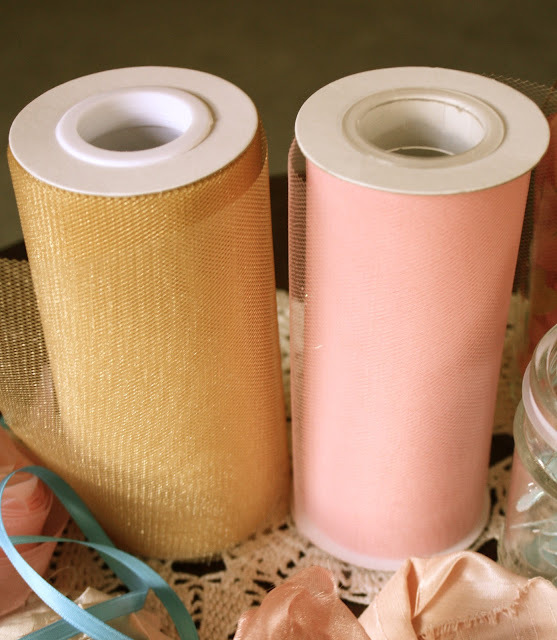 I found these rolls of tulle at our local party supply store for about $3.50 each, using a roll instead of tulle from the bolt was very convenient. 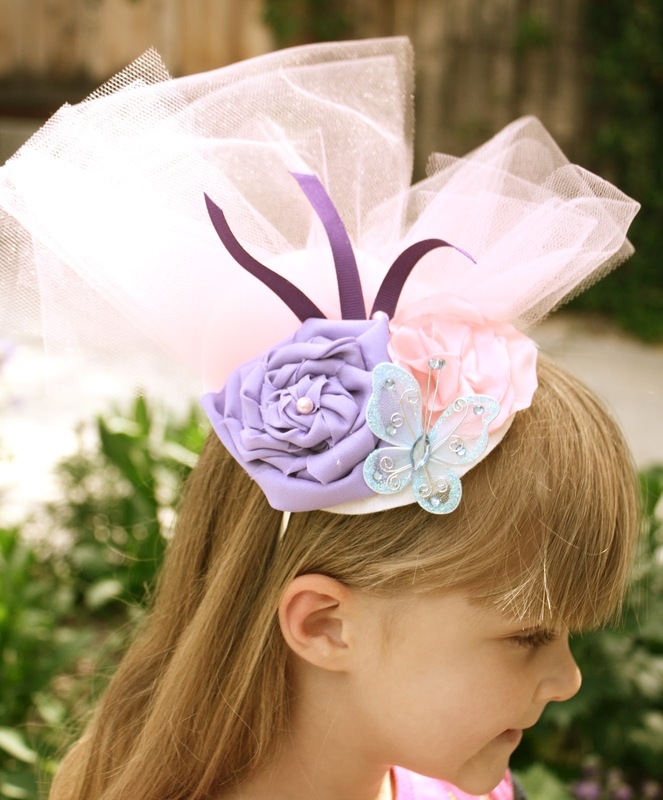 While I was attaching the tulle, the girls picked from the assorted trimming and started designing their hats. I took some time in the days before to make several fabric flowers. If you need some ideas of how to put these together here are two good tutorials. I hot glued mine together. 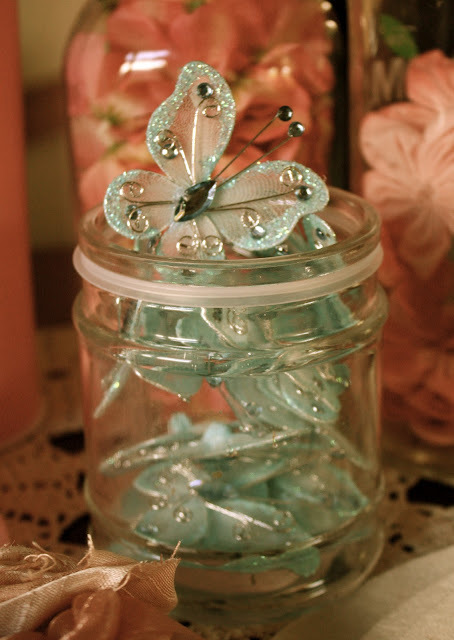 Lydia wanted to make sure blue was included and I loved these butterflies I found at the party store in a pack of 20 for about $4. Once they decided what they wanted they brought everything to me and I put glue where they wanted it and they stuck their trimmings on. It went really smooth. This one was designed by my 5year old. I was worried about what she would want but thought she did a great job. I made four fascinators the night before, one for each of the women helping at the party. It was really fun, and would recommend this activity for women too. Did anyone notice Lydia's cute tea dress. I desperately wanted to make her a lace dress for the party but knew I had limits especially because I wear out so easy these days. Luckily I found the Timepiece Dress from DownEast at their clearance center the week before the party. I found it in a women's medium size but it was only $10 and I knew it would be easy to scale down to Lydia's size. After 40 minutes of altering we had the perfect tea dress. I unpicked the sleeves, brought down the shoulder line, tapered in the sides and reattached the sleeves. I also added a ribbon belt and an old flower clip we already had. I love the lace and embellished neckline. For more info about the party go HERE. What a neat party idea! I am sure the girls had so much fun accessorizing their tea hats- headbands. gorgeous! 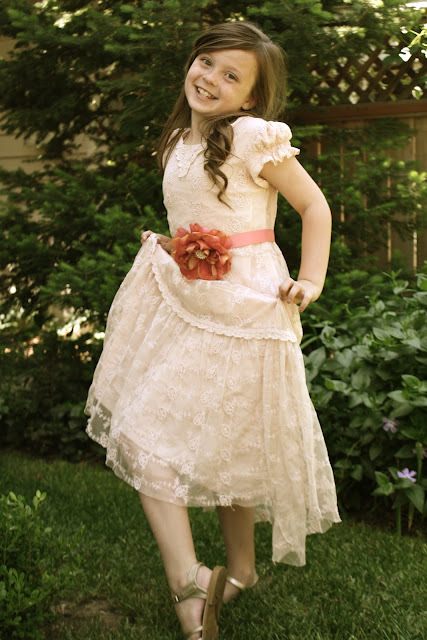 love her dress, and the fascinators are so, so pretty! Next time I have a tea party we're making those, loL! Whoa, super talented! How much fun are these head pieces? I remember making a head piece/hat one Halloween when I dressed up as Scarlett O' Hara. My mom altered an old dress to fit me (I was in middle school). It was the best Halloween. Hands down. These are absolutely GORGEOUS!! You do amazing work and I love your blog! Love the paper flowers and butterfly in her hair.